Each year at this time I ask if you’ve begun to set your writing goals for next year. And I know to some of you the mere thought of planning and scheduling your dreams sounds like the biggest drag in the universe. And it can be. Your past experiences may range from boring, to painful, or terrorizing. But it doesn’t have to be that way. 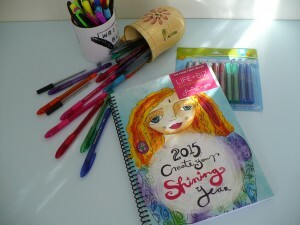 Why not make this a playful exercise that jumpstarts your creativity going into the next year? All you manly men out there, I hear you moaning, “But it’s so colorful and girly!” So, call the women on these pages your muses, man up, and take advantage of this tool. You can always draw mustaches and sideburns on them, tape the book to the underside of your desk drawer, or save the digital version to a hidden folder on your laptop, labeled “Manly Man Stuff – Keep Out!” so no one else can lay eyes on it. Or you can use bold, black markers instead of colorful pens and pencils. But next New Year’s Day, you’ll be laughing at any of your buddies who were afraid they’d appear “sensitive” if they used this tool, and gloating as you realize what an incredible year you created by consciously working through this planner. For those of you thinking a funky, vivid workbook is a frivolous approach to your writing career, remember, Jack wasn’t a dull boy for no reason. And you’d have to convince the over 40,000 women who have planned their various businesses to huge success with the in-depth processes in this tool. If you’ve read my previous end-of-year posts about goal setting, you know I’m now specific about my goals and when I want to reach them. But in the far past, I would reach the end of a year not even knowing if I had accomplished what I planned. That’s because I never wrote my goals down. And I certainly never reviewed the year to see what worked and what I wanted to improve. Notice the positive language I used. I’m not going to tell myself I “failed” to reach some of my goals because I don’t want that soundtrack playing in my head for the next year. I’m going to be focusing on “this worked for me, let’s do more of it” and “let’s tweak this” thoughts. With the guidance of Leonie Dawson’s wonderful annual planner I began analyzing how the past year flowed before I planned the coming months. Before practicing this concept, if I even looked at what I had done in my personal life goals, I might have ignored the accomplishments toward my writing goals, or vice versa. Now I am amazed at the number of wins I identify in both areas. I realized if I don’t know where I am in my long-term planning, I can’t expect to choose the right path to move toward my next dream. That detailed review feature makes this planner worth three times its price (which is very reasonable) for what it delivers in realized action on my part. Once I finish acknowledging what I’ve done, and spend some time being amazed at the accomplishments I hadn’t paid attention to as they happened, I move with focused attention to move my writing, editing, and coaching in the direction I desire. 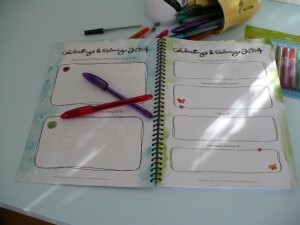 Leonie also taught me to keep my workbook handy so I can review my goals each month. That’s so much more effective for making things happen than waiting until the end of the year to check where I am and where I should redirect my time and energy. Midcourse corrections require a lot less work than when you find yourself in the wrong port at the end of a long journey. I dare you to try something different, something fun, this year to give yourself a chance to see how much faster you move toward your goals when you approach them, not as something you have to get through, but as something you can’t wait to do. The above links are affiliate links. If you click one and make a purchase I’ll receive a small reward, at no cost to you. And I’ll thank you!